I love the pictures of Baudouin. Has his cause for beatification been introduced? The possibility was discussed recently, but I don't think his cause has actually been introduced. 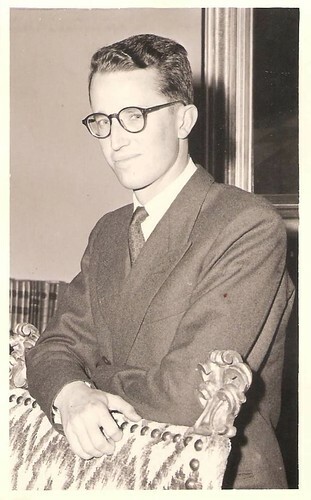 Matterhorn, thanks for posting all these photos of the Belgian royal family through the generations. I read your blog regularly--I'm sorry you had to discontinue "Sword & the Sea" one. I've learned a lot from both! Thank you, dear Princess Garnet! A hilarious story of Queen Fabiola's humorous and brave stand against repeated death threats, on Belgium's National Day. 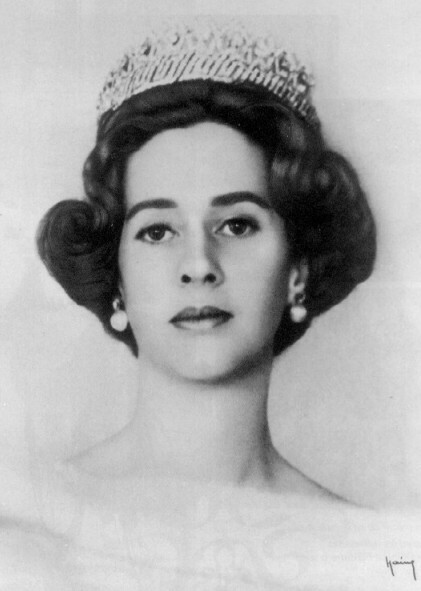 Queen Fabiola showed humour by mocking her would-be assassins, who had written in anonymous letters to newspapers she would be killed with a cross bow during the national day celebrations. ‘Here is an apple’, the queen seemed to say, ‘so, where are you William Tell?" A beautiful photograph of a young Fabiola. 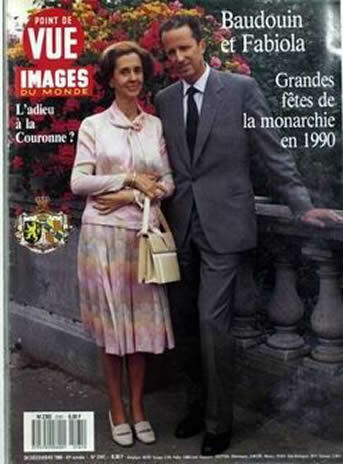 Today is the nineteenth anniversary of King Baudouin's sudden and quite untimely death. He was only 62 when he succumbed to a heart attack at the Villa Astrida in Motril, Spain, his beloved wife's native land, leaving behind a famously sorrow-stricken widow and nation. Less well known is the grief and concern of his long-distanced, aged step-mother, Princess Lilian of Réthy. She is usually described as taking a cold, spiteful, unforgiving and uncaring attitude to Baudouin after his marriage and separation from his parents, but this is far from being the case. In Le mythe d'Argenteuil, Michel Verwilghen describes Lilian's worries, during the King's last years, that the medical care he was receiving would not be sufficient to stave off cardiac failure for long. (See especially pp. 401-406, for her concerns and her reactions to Baudouin's death). Baudouin's physicians had diagnosed him with Barlow's Syndrome, or mitral valve prolapse, and an open heart operation had been needed. Lilian deeply regretted Baudouin's decision to undergo surgery in a Paris hospital rather than in a university clinic in Belgium. After discussing the matter in depth with various specialists, she had become convinced that the techniques used by Belgian surgeons would have a better chance of providing lasting relief to the sufferer. To visitors at Argenteuil, she would confide her foreboding that Baudouin's repaired mitral valve would hold for a year or two, and then suddenly give way. 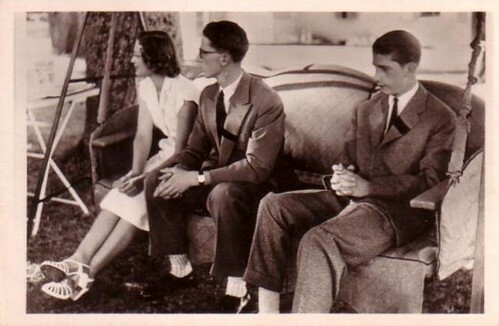 Lilian's fears were accurate. Within two years, she was indeed to suffer the brutal loss of her bien cher Baud, whom she had continued to love and admire despite the pall cast over relations between Laeken and Argenteuil for many decades. Out of consideration for his step-mother's feelings, Baudouin's younger brother and successor to the throne, Albert, personally notified her of the sad news on the night of July 31, 1993. As always, the Princess did her best to keep up a brave front in misfortune, but she could not conceal her sadness from her nearest intimates. Baudouin's death also presented Lilian with a painful dilemma. She realized that any course of action would be held against her, whether or not she attended the King's funeral. If she joined in the sorrowful ceremonies, she would be accused of being hypocritical or wanting to be the center of attention. Her gesture might even be seized upon as confirmation of the scandalous rumors that she had been her own step-son's mistress during his youth. In addition, she might embarrass Queen Fabiola and the rest of the royal family. She would certainly complicate protocol for the officials responsible for the occasion. On the other hand, if she did not go to the funeral, she would be branded hard-hearted, bitter and vengeful. In the end, after consulting with her children and trusted advisers, she decided not to attend in person. Instead, she sent her son, Alexandre, and her daughter, Esmeralda, to represent Argenteuil on the solemn day. 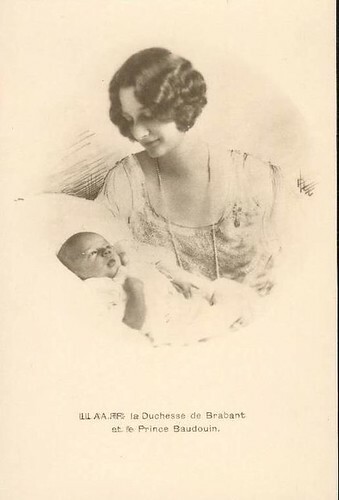 I see no reason to doubt, however, that Lilian mourned her King, whom she had so affectionately helped to raise, no less and probably much more than any other loyal Belgian. 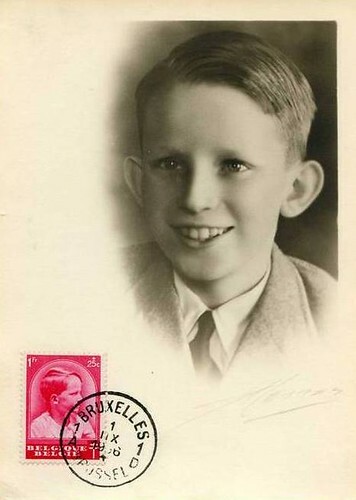 It was said that at the birth of Baudouin, his Swedish mother Astrid exclaimed: "Now I feel truly Belgian!" I think this picture is lovely, showing the tenderness between Baudouin and Fabiola. Queen Fabiola is still alive, isn't she?